What does the variance covariance matrix actually do. And when I have computed it as below how to I add this to the residuals to so that I get the White residuals. I know how to calculate the OLS its projection matrix and how to calculate the residuals, I am also able to calculate the formula given below, I am however not able to see how to move further to correct the errors that I have extracted by calculating the OLS. Please help, are several students(class mates) that are struggling with understanding this. Our teacher said that we need to be able to do this before we get our assignment because apparently our assignment relies on getting a list of the corrected residuals. 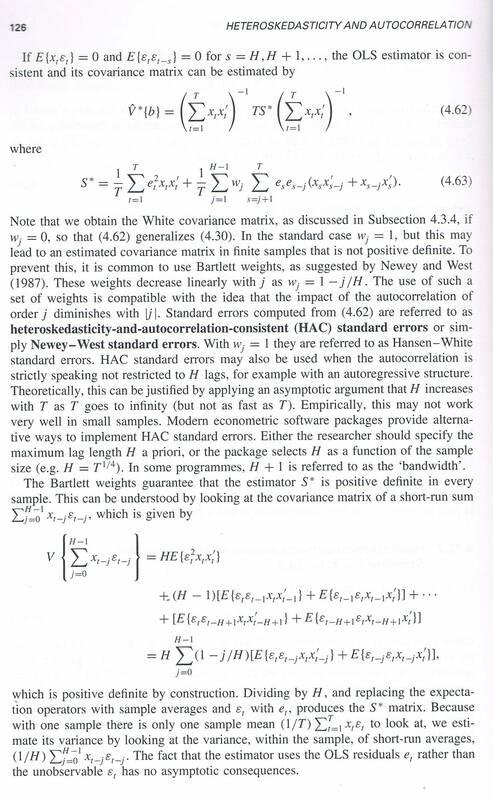 What I want to compute is a vector with the residuals after applying the newey west standard errors. There is a reason why I need this list of standard errors. I therefor wonder if anyone would be so kind and explain how to do this step by step. Browse other questions tagged mathematical-statistics matrix or ask your own question. Covariance Matrix vs. Pairwise Covariance Matrix? How are the standard errors of coefficients derived in a regression? How is the determinant of $(X'X)$ related to variance?